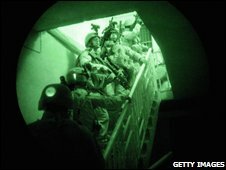 A "grenade" camera, that would enable soldiers to look into hazardous areas, is being developed for UK troops. Dubbed the I-Ball the wireless device is robust enough to survive being thrown onto a battlefield. The I-Ball's internal camera gives a 360 degree view, with images being sent from the instant it is launched. It is thought the new technology would enable soldiers to see into potential danger spots without putting themselves at risk of ambush. The ball can be fired from a grenade launcher - or thrown into a room - giving troops vital information of who - or what - is on the ground or around the corner. Inside the sphere are image sensors and two fish-eye lenses. The data is then sent back and remapped through a type of processor known as a Field Programmable Gate Array which compensates for spin and tumble and then displays a true 360 image in real time. The concept came about as part of the Ministry of Defence's (MoD) Competition of Ideas in 2007. 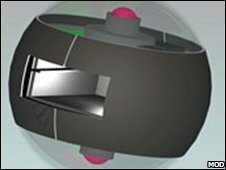 Paul Thompson, from Scotland-based firm Dreampact, which is developing the I-Ball, said that although the gadget was still in the early stages of development, he had high hopes of it being able to perform well on the battlefield. "We have overcome some significant technological challenges in developing the I-Ball technology," he said. "Although it is in its early stages, we are very excited about the technology's potential to help our troops to be better prepared for battle. " The MOD's director of technology development - Professor Andrew Baird - also sounded a positive note. "The technology behind I-Ball is an exciting new development that has very significant potential across a range of military equipment and operational scenarios, particularly in difficult urban operations," he said.